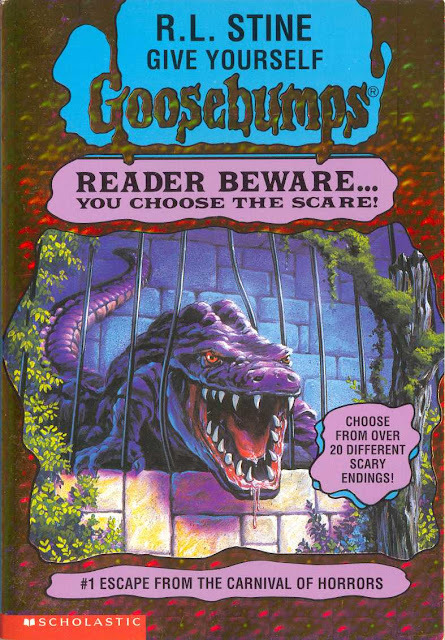 Holly's Horrorland: Fridays YOU Choose The Scare! or any Choose Your Own Adventure book? Well, get ready to experience it again! Every Friday YOU get to choose the subject of next Friday's post. Not only that, YOU can write it too! 1. What subject do you want the post to be about? 2. Do you want to write it or do you want me to? oh that sounds like a great idea and i am looking forward to what your readers come up with! Hopefully! Is there a subject you'd like to see? My mind is drawing a blank at the moment. A night of thunderstorms and a frightened cat went a long way toward slowing down my my brain functions. Now hold on. That might make for an interesting topic. The thunderstorm in Gothic movies and literature. Ooh, yes! The thunderstorm is an important player. Without it, Frankenstein's monster would've never been brought to life! Let's see if I can complete a post about this by Friday. *crosses fingers* Thanks for the idea!